Whiskey Skies, originally uploaded by navandale. Spectacular sunset over the Oak Bottom arm of Whiskeytown Lake. This was my stop after leaving Redwood National Forest on my National Park trek. I wasn't actually expecting anything special to come from Whiskeytown National Park (in comparison to many of the other National Parks I have seen and would see). That thought was stoked by the fact that the waterfall that I had wanted to visit and photograph had all sorts of trail-construction. On my approach to Whiskeytown through Willow Creek, I could tell that the sunset was going to be beautiful... But, I was surrounded by canyon walls, and really wanted a shot with Shasta Bally in the background. Well, as I exited the canyon and rounded a bend I saw this scene... I had to stop! Fortunately, there was a campground parking lot about 50 meters ahead. I pulled in, parked, and rushed to get my camera and tripod. In my flip-flops I navigated the steep, thistle-covered bank to the shore-line. The shoreline didn't offer much in the way of foreground... all there was was a lonely rock far off to the side, which only offered one angle of view (lest I include the man-made embankment that made up the northwest shore). I considered photographing the scene with just lake and sky, more of an exact mirror, but it just wasn't as interesting without something in the foreground. So, I got my tripod folded wide open to allow for a nice low angle on the rock, and still see enough sky. The only available angle from which to shoot the foreground, not get the man-made embankment, but still see the clouds and mountains required that I put the legs of my tripod in the water, and I squat in a smelly mud. I took a series of shots as the light quickly changed, but this image was the first I captured, and the best of the evening. The only way to capture the completeness of the scene was to shoot it as a panoramic. This is an HDR pano made from 4 horizontal frames. Each frame is an HDR image created from 3 RAW images using Photomatix Pro. Pano stitched in Photoshop. Very little post processing was done to this image. A little dust-spot stamping, unsharp mask, and noiseware standard in the sky. 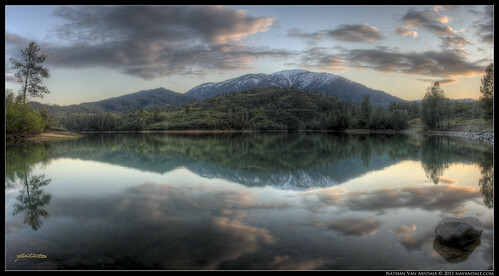 Whiskeytown is spectacular. I love living here.